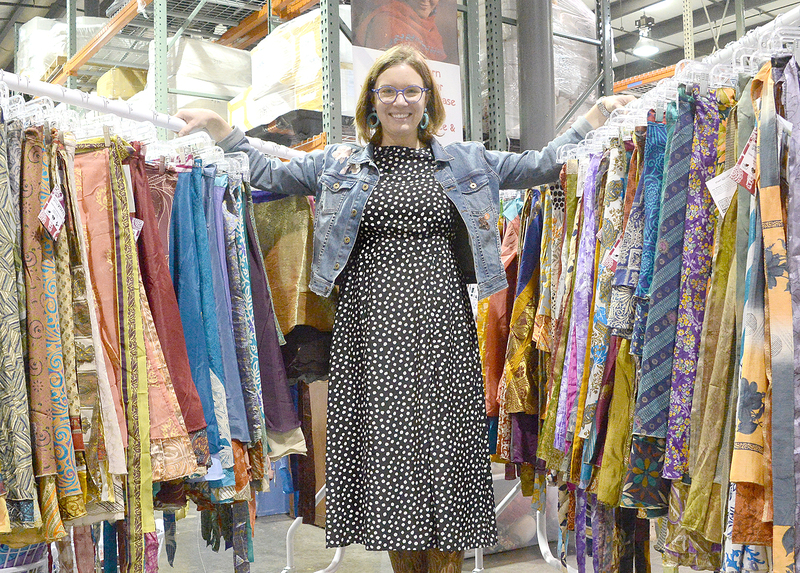 Nicole Snow moved her business, Darn Good Yarn, to a new location that has 10,000 square feet of warehouse space and 2,000 square feet of office space. Most of the product is hand-made in India or Nepal and most uses recycled materials. A yarn spun from scraps of saris (draped female garments from India), brightly colored, silky to the touch and ideal for a novice knitter, was Snow’s first product. The yarn was hard to find. Only three suppliers in the United States sold it and it was a seasonal product. For the women who made the yarn, it was something they did when they could not work in the fields. Snow, who calls herself “a very accidental entrepreneur,” set out to change that. Drawing on contacts from previous work for a general import business, she contracted with cooperatives and sole proprietors in Nepal and India, providing about 600 full-time, year-round jobs at wages similar to the minimum wage in the U.S. and two or three times the local wages, she said. Three years later, Darn Good Yarn sells close to $9 million worth of craft supplies and clothing annually, according to Snow. The business recently moved into a new location near Route 146 in Halfmoon. The new location includes 10,000 square feet of warehouse space and 2,000 square feet of office space. Snow plans to divide the company into two entities, one selling craft supplies and the other selling clothing and lifestyle items. Currently, clothing accounts for 73 percent of the company’s revenue, she said. Like the yarn, most of the clothing is brightly colored and silky. It includes skirts and tops, baggy pants and whimsical socks. The company also sells other yarns, including hemp yarn and New Zealand wool, dyed and spun in Nepal. Craft kits for knitters and sewers are another popular product. The kits are assembled and shipped by workers at Saratoga Bridges workshops. Snow hopes to reach the rate of 30,000 kits a year in the next six months and 100,000 a year in the next two years. A yarn-of-the-month club currently has 13,000 subscribers and is also growing. Locally, the company has 11 full-time and three part-time employees. A company in the Philippines has five employees dedicated to handling customer inquiries for Darn Good Yarns. Two individuals in India help to find new suppliers and vet them for acceptable working conditions, wages and the like as well as the quality of their output. At the previous location in Schenectady, the company had a retail outlet for a while but, for now, there are no plans for a bricks and mortar outlet. “Online has been a very successful venue for us,” Snow said. The company’s website is darngoodyarn.com.